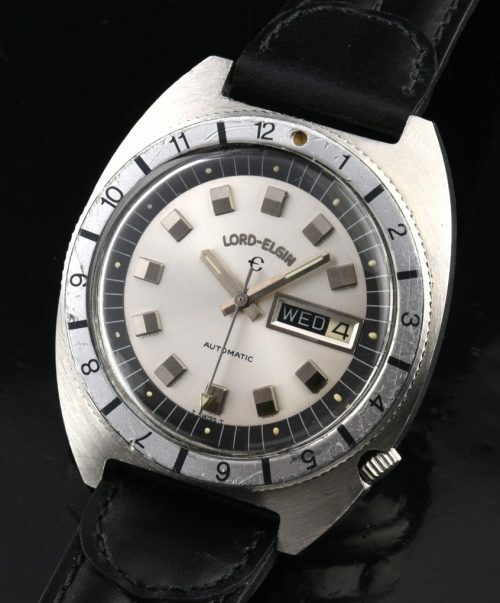 This 1970’s vintage LORD ELGIN automatic really has a great vintage look on the wrist. The turning original bezel, original silver and black dial with large rectangular markers and baton hands looks amazing. Notice the original arrow-tipped second hand. The automatic winding Lord Elgin SWISS movement was just cleaned and is accurate. The large 39mm. cushion shaped stainless steel case looks very good. This is NOT a common watch.